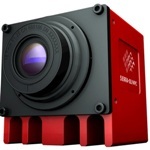 Sierra-Olympic Technologies has been involved in thermal imaging for more than two decades since the introduction of solid-state thermal imagers. This article addresses questions users may have regarding how heat is focused, how sensors detect heat and how this heat is displayed. A huge amount of research is taking place in this field of thermal imaging to enhance it further. Today, thermal imagers have progressed greatly. In basic terms thermal imaging involves a sensor, a thermal scene to be an imaged, a lens to deliver information to the sensor and a display to interpret the data. The ideal way to comprehend thermal radiation is to look at Sir Frederick William Herschel’s method of infrared radiation in 1800. Herschel analyzed sunlight through a prism (Figure 1). At this point in history it was already known that the wavelengths of visible light are split by a prism, which is observed as a rainbow. Figure 1. Herschel used a prism and thermometers in his experiment that eventually led to the discovery of the infrared region of the eletromagnetic spectrum. By placing one thermometer on the high wavelength colors, such as blue and violet, and another beyond the red wavelengths you can see that the second thermometer has a higher temperature. This temperature increase is caused by infrared 'light' which is beyond the visible spectrum. Infrared light is sensed as heat; it is this radiation that Sierra-Olympic Technologies image with their cameras. All things emit infrared (a.k.a. thermal) radiation. These emissions occur at all temperatures above absolute zero (-273°C). The amount of infrared emitted is dependent on the objects temperature, for example Humans emit far less infrared than the sun. Infrared cameras have been developed to be highly sensitive to the intensity of infrared radiation emitted by objects on the earth, i.e. by objects at 'normal' temperatures, with enough contrast to produce excellent images. Numerous infrared imaging research papers are available on the Internet. Infrared imaging is not only useful but also fun. Sierra- Olympic Technologies are partners with DRS Technologies; the company that invented infrared imaging in the 1960's. Human eyes see visible radiation, whilst thermal imagers see infrared radiation (Figure 2). It is possible to purchase a 10 MP camera with the capacity to capture snapshots and videos for $200. Smartphones are becoming increasingly more prevalent in the modern world, to such a point that their cameras now only cost a few dollars. Thermal imaging is yet to reach this point in part due to a lower customer base but also due to the expensive materials required to produce them. Sensors in thermal imagers are made from rare materials and the lenses are constructed using unusual materials such as zinc selenide and germanium, all of which are more expensive than the silicon and gallium used in conventional cameras. However, by exploring new technologies and processes Sierra-Olympic Technologies are manufacturing affordable thermal imaging cameras which can used to economically locate and image heat. 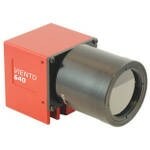 The market availability of optics for infrared cameras is very limited in comparison to the variety of visible optics. As glass is opaque to thermal radiation it cannot be used. The optics for thermal imagers are usually constructed out of rare materials such as zinc selenide, germanium or sapphire. This makes the selection of infrared optics available limited and expensive. Switching between lenses with an SLR camera is simple; one lens can be taken off and another installed in a matter of seconds. This is not possible in thermal imaging as the camera and lens are designed together. If another lens is installed, it does not function as well. Although certain tricks can be used to try and get around this, one lens is typically for one camera in the case of thermal imaging. Sierra-Olympic Technologies offer two 320 x 240 (QVGA) and 640 x 480 (VGA) imagers. Larger arrays are available but these are complex and expensive. Today most people on Earth have a cell phone with a camera that takes images in the visible region. Thermal imaging does not yet have a large enough customer base to develop a $50 web camera or a $200 snapshot camera. However, the price of infrared cameras has dropped significantly in the last decade. High speed, 3-CCD, windowing, binning, and triggers functions that are generally found in advanced cameras are not available in Sierra-Olympic Technologies’ value priced cameras. In order to possess these camera functions, customers will have to pay a very high price ranging from $50,000 and beyond. Sierra-Olympic use the latest cutting edge technology, and cut down on unnecessary gimmicks and features, to bring our customers practical and affordable infrared cameras. The Cameras produced by Sierra-Olympic are capable of high-resolution thermal imaging over a wide range of intensities whilst remaining at four figure prices. This information has been sourced, reviewed and adapted from materials provided by Sierra-Olympic Technologies Inc.
For more information on this source, please visit Sierra-Olympic Technologies Inc.